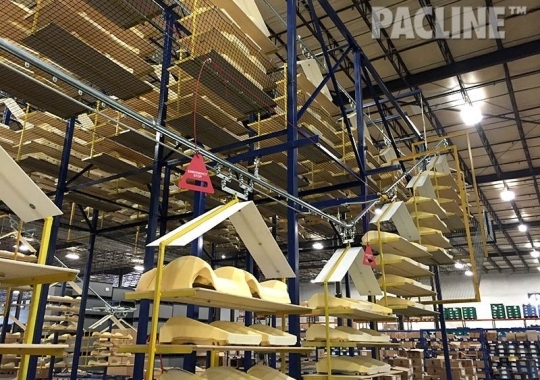 PACLINE can provide a solution to allow a quantity of parts to be stored overhead, an area that is often considered unusable. Our overhead monorail track, PAC-MAX™ heavy duty conveyors and I-Beam conveyors can be used to create relatively inexpensive “live storage” systems. Overhead storage is often required when the rate of production versus assembly of product is out of balance. 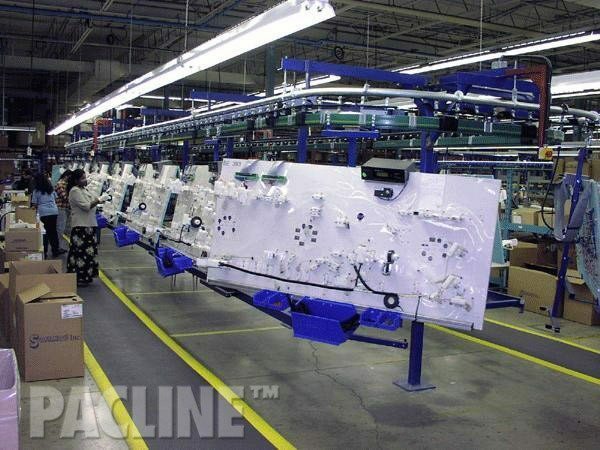 A typical example is the production of plastic automotive instrument panels, where the plastic substrate can be molded much faster on two shifts, while the assembly of the components requires three shifts. Excess parts are stored on a conveyor to be retrieved and used on the third shift. Overhead conveyors are ideally suited for this application. Inclines and declines are easily achieved without the need for additional drives. Parts can be placed on carriers where there is no relative movement between part and carrier and hence no damage. The conveyor can either be running continuously while loading and unloading, or it can index for accumulation. 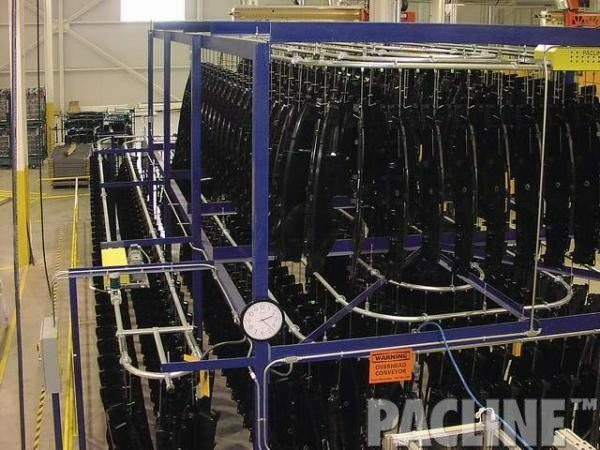 In certain applications, the conveyor can become a storage and retrieval system with the addition of a PACLINE Computerized AS/RS interface. Parts can be loaded randomly across one or more conveyors and specific parts retrieved on command. The human machine interface will accept the part number, find an ideal storage location on any number of conveyors and allow retrieval when desired. This approach allows the production of “batches” of like parts to be made efficiently, while the retrieval of different parts can be done in any order. Parts buffers are often the best way to smooth out problems in the manufacturing process. Overhead conveyors can be used effectively and efficiently to convey parts through the manufacturing process while providing the desired level of parts buffering between operations. 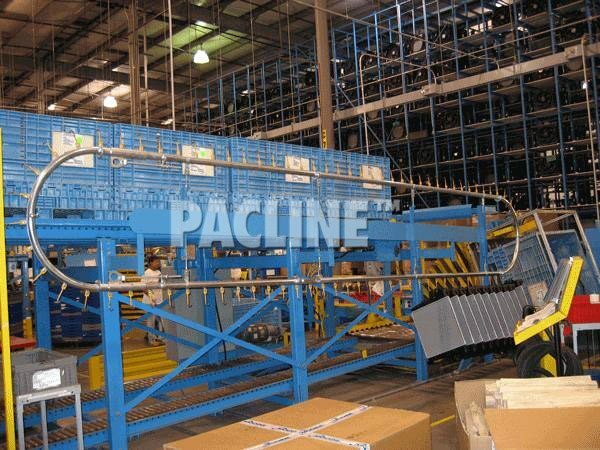 Parts buffering can be accomplished by adding conveyor chain and track that loop back and forth either overhead or at floor level. If one operation should stop, others can continue until the buffer is used. 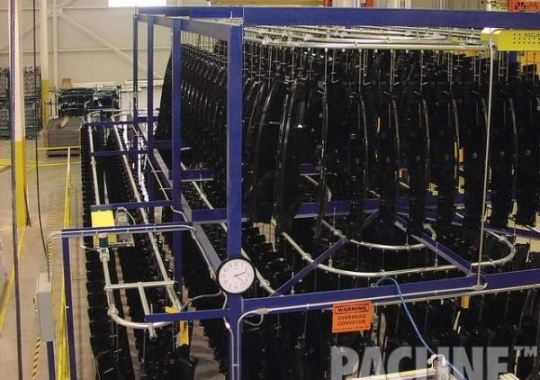 A PACLINE conveyor can allow parts to be stored overhead, an area that is often considered unusable. 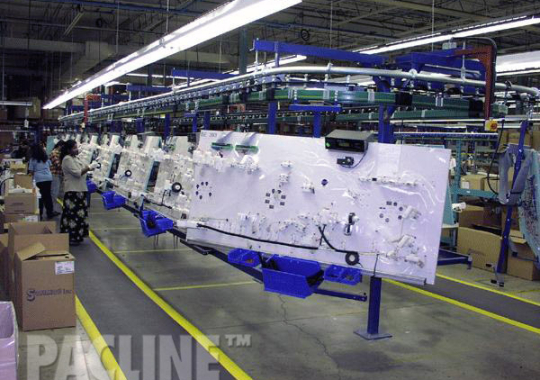 Overhead systems can act as a “buffer” when the rate of production versus assembly of product is out of balance. The system can be designed to run continuously while loading and unloading, or it can index. 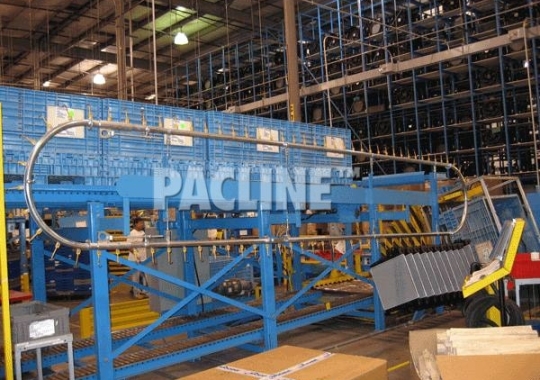 Conveyor can become a storage and retrieval system with the addition of a PACLINE Computerized AS/RS interface. 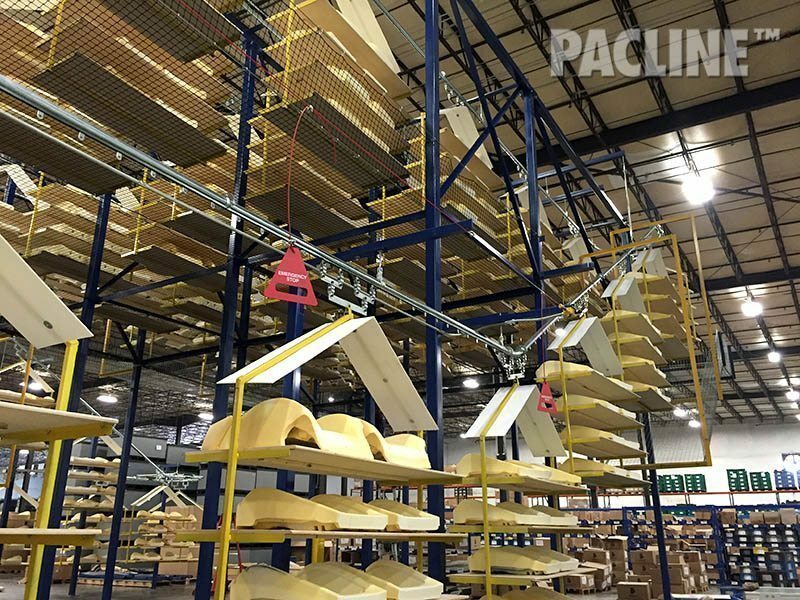 PACLINE’s unique low profile conveyor track with tight radius curves make it easy to install within your existing production equipment.